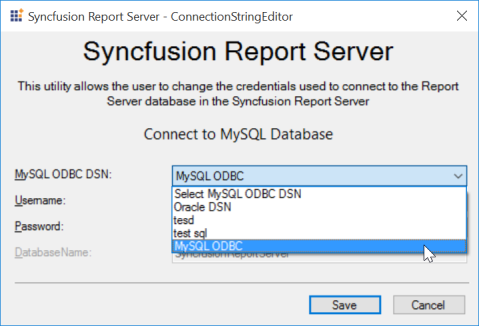 How to update credential details on the connection string for Report Server MySQL database ? 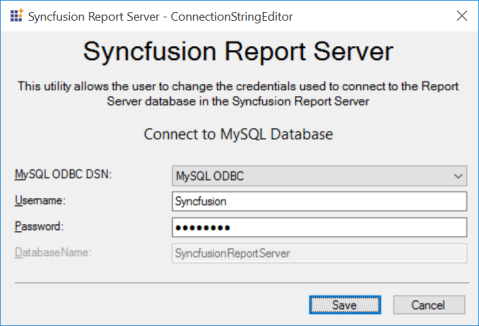 The credentials used to connect to the Report Server database in the Syncfusion Report Server can be changed at any time. Report Server is deployed in the below location by default. 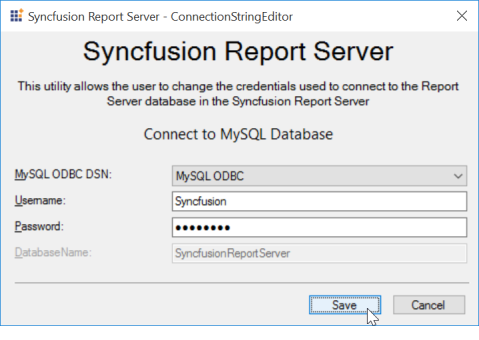 We have shipped a utility with the Syncfusion Report Server application in the below location. Figure 1: ConnectionStringEditor utility installed location. Figure 2: Stop Syncfusion Report Server. 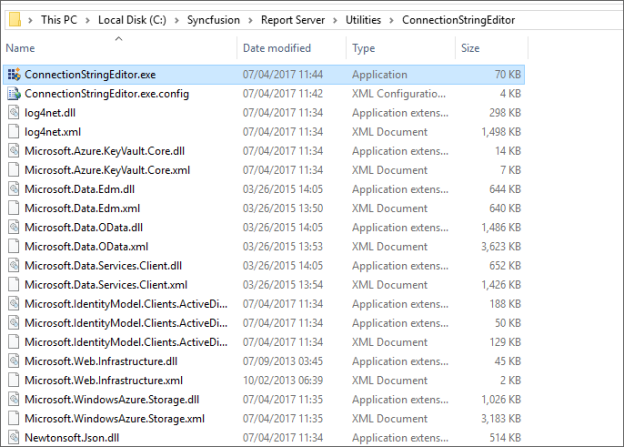 Step 2: Open the ConnectionStringEditor.exe tool in installed location. Figure 3: Syncfusion Report Server -Connection String Editor form display. Step 3: The connection details that were supplied while starting up the Report Server application will be populated in the utility. The DSN, Username and the password can be changed for the MySQL database. Figure 4: Select DSN Connection. 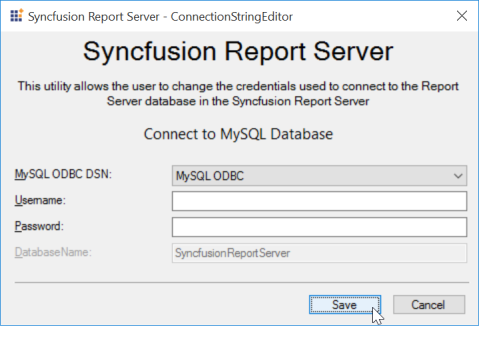 Note: This utility cannot be used when SQL CE database is chosen as the Report Server database in the Syncfusion Report Server. Step 4: If the Username and Password for the database has already been given in the ODBC driver, it is not needed to be filled in this utility. In this case, leave the Username and Password field as empty and then directly save the connection details. If the login credentials are not given in the ODBC driver, this utility needs a Username and Password field to fill. The utility will test the connection to the database with the given details. If the connection test passes, the new connection details will be updated in the connection string of the Report Server database. Figure 5: Save the connection details without login credentials. Figure 6: Save the connection details with login credentials. The tool will change the Database Credentials and will return a “success” message if the process underwent successfully. If there is an error occurred in the process, the tool will generate an error log in text format in the below location and display the error log file name. Please create a support incident attaching this error log file for us to check the issue and give a solution.